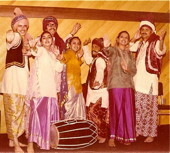 A photograph taken during the summer of 1976 of a bhangra team formed by students at Cleveland State University and local high school students to perform during American bicentennial celebrations in the tour of cities in the Midwest. The team performed that summer in Kentucky, Ohio and perhaps other nearby states. Flyer for May 6, 1983 concert performed by Sojourner at the Katherine Dunham Theater in Chicago. 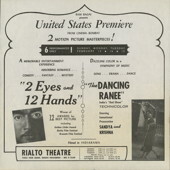 Advertisement for "2 Eyes and 12 Hands" and "The Dancing Ranee"
Advertisement for the U.S. Premier of two Hindi films, 2 Eyes and 12 Hands and The Dancing Ranee presented by Ram Bagai at the Rialto Theatre in Pasadena, California in February 1966. Article from the July 27, 1968 issue of Saturday Review titled "Sangeet: An Approach to Indian Music," by Raghava Menon. The article describes the key features of Indian classical music, and describes it to Western music. Flyer for "Lecture / Demonstration by Habib Tanvir"
Flyer for a lecture and demonstration in 1996 on India’s theatrical traditions by Habib Tanvir, renowned journalist, actor, director, poet, and playwright of Charandas Chor (Charan the Thief).